It’s pretty annoying that the traitor and genetic male Bradley Manning got an early release from prison for telling everybody he was really a girl, and it’s even more annoying that he’s been embraced as a martyr by the mainstream media. But even more annoying than that is his use of emojis. If you can’t make that out, it’s a pair of scissors, a pair of nuts, and a clown. In my opinion, that describes Bradley Manning to a T.
Twitter has right to do that. It’s a private platform and can enforce its own rules, even if it seems arbitrary to the rest of us. 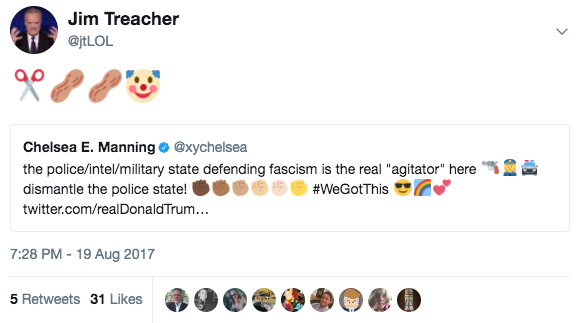 I’m just amused that the SJWs are now punishing people for using the wrong emojis. I hurt a traitor’s feelings with a few emojis. Well, at least I got a blog post out of it. I’ve got a sabbatical from the Internet planned soon, and stuff like this is going to make it a lot easier. Social media has driven everyone insane. You can all be hysterical idiots without me. I’m gonna party like it’s 1994.